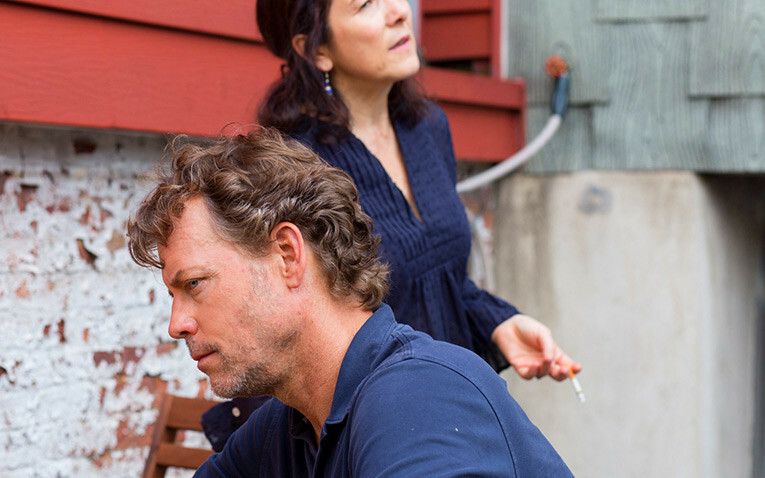 Ira Sachs’ new film Little Men is an eventful New York cinematic gift wrapped in a small box. In this quiet drama that will fittingly open BAMcinemaFest on June 15th, a relatively simple business matter is complicated by family, friendship and feelings of angst. The questions posed are universal and explore a side of the new New York that is often simplified into a punch line or buzzword. We all know that gentrification is happening, but what does it look like, really? Shows from Girls to Broad City joke about the yuppies and hipsters taking over Brooklyn, but few go into detail about what it means to threaten the livelihood of a beloved tenant by raising their shop’s rent. This proposed rent increase is the main conflict anchoring the film. After Brian’s (Greg Kinnear) father dies, he inherits the building he lived in which includes a dressmaker tenant named Lenore (Paulina Garcia) with a little shop on the bottom floor. Lenore makes it clear to Brian that she was very close with his father and that he wanted her to stay. But the neighborhood is changing and the space is worth five times what she currently can afford. Lenore has no intention of paying the difference, but Brian and his sister have families to support. Brian’s wife, Kathy (Jennifer Ehle), is a psychotherapist ‘trained in conflict resolution,’ and also happens to be the breadwinner in lieu of Brian’s flailing acting career. Lenore adds to Brian’s feeling of emasculation with painfully acute attacks on his character as a father and a son. Sachs builds up the emotional struggle by focusing on a friendship between the two 13 year-old sons, Jake (Theo Taplitz) and Tony (Michael Barbieri). Tony becomes Jake’s first real friend, and their growing bond is equally heartwarming as it is devastating. Between videogame levels and scooter rides, Tony acts as a champion and advocate for Jake’s drawings. He hopes they will go to LaGuardia high school together. Between them their friendship is never in question, but their parents’ quarrel threatens its very existence. There are many sweet and charming exchanges such as when Tony gets into a heated game of verbal chicken with their drama instructor. The cinematography and art direction paint Brooklyn as a vibrant bohemian utopia, and the uplifting score (which may be sneakily reprised as a techno tune in the club scene) maintains the feeling of a hopeful outcome despite the circumstances. At times it feels as if the audience is being lulled into naiveté in the same way the boys are. But as anyone who has had real estate disputes in New York knows, it will not end amicably. In an act of rebellion, the boys give their parents the silent treatment, even on Brian’s opening night of his new play. This boils over in a powerful scene where Brian pulls over the car and chides Tony on the idea of rejection. Soon after, Tony gets his first taste of rejection when asking a cute girl to the beach. Perhaps Brian, in realizing the truth in Lenore’s criticism of him, releases his frustration with himself on Tony. Another poignant moment comes when Jake breaks his silence to beg his parents to work it out with Lenore after finding out she is being ‘evacuated’ (evicted). His desperation in this moment is one of the film’s small tragedies, of which there are many. Little Men is about the tragedy of decent people making inevitable decisions.